As a liberal New Yorker I'm often somewhere between frustrated and amused by New Yorkers' attitudes toward guns. I understand where they are coming from: New York *would* be safer if there were no guns in the city. New Yorkers are more cosmopolitan (read more European-like) than any other people in the USA, and guns are not part of their culture. The police are never more than three blocks away in New York, and most New Yorkers would rather trust their safety to the NYPD than take their defense upon themselves, and, quite frankly, this makes sense--so long as you trust the police to be there when you need them (not so much, even with the number of cops in this town) and you trust the government not to turn tyrannical, which frankly most New Yorkers cannot fathom. Gun violence is the single biggest cause of death among young African American men. A simple truth that the NRA simply cannot deny is this: more guns lead to more gun deaths. To the vast majority of New Yorkers Mayor Bloomberg is a hero for his position on guns. But, of course, I understand the pro-gun position better, as that is more or less the position I hold. No, this is not yet another observation on how New Yorkers really do not understand guns (and really don't want to). I am a rabid fan of The Daily Show with John Stewart. He is one of the two best news sources on TV (the other being Maddow), but more than that he is the most insightful analyst of media working out there today, and I include Noam Chomsky in that statement. Tonight he was doing a riff on how MSNBC and Fox News polls almost always fun in the 90% bracket on any topic they poll, because the audiences are skewed and they more or less just vote for the opinion just expressed by the host (he showed how a Fox poll shows that 97% of the people don't want to raise taxes to pay for health care, and how an MSNBC poll showed that 95% of the people want to raise taxes to pay for health care). Then he had on David Cross, one of my favorite comedians. But Stewart and Cross had a very funny exchange, with cheers from the audience, about people showing up to Town Hall meetings with guns. Stewart suggested that in a strange way, among some people, the 1st and 2nd amendments are being conflated, as though carrying a gun is not only a right in itself but is also a means of expression, a protected form of speech. Cross followed that with the idea that the gun, a second amendment thing, actually has its own 1st amendment rights. Wearing a gun is making a political statement. Whether or not it is protected speech is irrelevant, because it is protected in and of itself. But it absolutely is a form of communication, and a form of political speech--which is the most highly protected form of speech. Cross and Stewart were mocking the idea, but I think Jefferson might have agreed whole-heartedly that wearing a gun to a town hall meeting is indeed protected speech. I am absolutely sure Andrew Jackson would. Stewart and Cross were also expressing a very real fear that somebody might pull out a gun and shoot the president. I'll be honest. That frightens me too. Unfortunately, it is part of our bill of rights that the people are guaranteed the means to resist tyranny with force. It's one of those dangerous risks we take in return for our freedom (Freedom is always risky, and as soon as you start hedging that risk you make society less free--it's the contradiction inherent in the "reasonable regulation" part of DC v. Miller). In fact there is a great deal of unofficial precedent for the idea that the final check on government is the guns owned by the people. Cultural if not legal precedent, that is. There is an interesting little science fiction story by H. Beam Piper with the unfortunate title of "Lone Star Planet" built upon this very theme: on the planet New Texas it is legal to kill any elected official at any time. That way they don't actually do anything for fear they will be shot, and they basically stay out of people's way. "whenever any Form of Government becomes destructive of these ends, it is the Right of the People to alter or to abolish it, and to institute new Government, laying its foundation on such principles and organizing its powers in such form, as to them shall seem most likely to effect their Safety and Happiness. Prudence, indeed, will dictate that Governments long established should not be changed for light and transient causes; and accordingly all experience hath shewn that mankind are more disposed to suffer, while evils are sufferable than to right themselves by abolishing the forms to which they are accustomed. But when a long train of abuses and usurpations, pursuing invariably the same Object evinces a design to reduce them under absolute Despotism, it is their right, it is their duty, to throw off such Government, and to provide new Guards for their future security." "Abolish." "Throw Off." The 2nd amendment is there to guarantee us the means to do so (Scalia, in DC v. Miller, acknowledged this explicitly). The militiamen know that. John Stewart does not. As I said, I agree with Stewart, I just understand that the whole idea does indeed come from the founding fathers. The constitution was not designed to prevent revolution, only to make it less likely. And armed citizenry as the final check on government is part of that system, in that the government that faces a heavily armed populace is less likely to become tyrannical for fear of it's own safety. No, in the end that doesn't work, since we have been tyrannical in the past ourselves, with institutionalized slavery and genocide, the examples of Iraq and Somalia show that a heavily armed country is not a more peaceful one, and the examples of Deadwood, Tombstone, and Dodge City show us that an armed society is not really a more polite society. And, I suppose, if the Government suddenly started executing Jews or Blacks or Gays, I'd likely change my tune and take up arms. "Any unarmed people are slaves, or are subject to slavery at any given moment. If the guns are taken out of the hands of the people and only the pigs have guns, then it's off to the concentration camps, the gas chambers, or whatever the fascists in America come up with. One of the democratic rights of the United States, the Second Amendment to the Constitution, gives the people the right to bear arms. However, there is a greater right; the right of human dignity that gives all men the right to defend themselves." Huey was protesting one of the first gun control initiatives in the US, the Mulford Act, which was designed specifically to disarm the Black Panthers and was signhed into law by that strict gun control advocate Ronald Regan. The Omnibus Crime Bill of 1968 followed, moving gun restrictions to federal law, in theory in response to the assassinations of the Kennedys and Dr. King, but also in response to all those rioting African Americans. Huey understood one of the great truths about Gun Control: that the result of Gun Control in the end is to keep guns out of the hands of common people and in the hands of the rich an powerful. The British understood this when they tried to take the colonists guns away, and the colonists understood this when they stood on the green at Lexington and refused to allow them to do so. To protest the Mulford Act Newton, Bobby Seale, and 24 other Black Panthers armed themselves and went to the the State Campital building in California. They wanted both to intimidate the legislature and to as Newton put it "get the story out" about the proposed bill. In other words, they were doing just what those people are doing who are showing up with guns to those health care town halls. They are making a point to exercise their 2nd amendment rights, and doing so in an intimidating fashion. 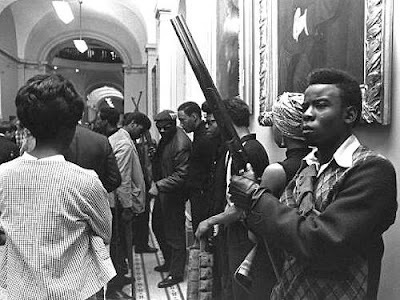 Newton's protest created one of the most iconic images of the sixties, the picture of the Black Panthers, armed to the teeth, standing in a hallway in the state capital, exercising their second amendment rights. So it's not just those crazies on the right. That's all I'm saying.